I began this U.S. Open week with a spin through the book of Judges, specifically chapter 19. You, no doubt, instantly recall this inspiring tale about the traveling Levite who finds late-night shelter from an old man in Gibeah, only to have some of the men-folk arrive with a male package they insist on delivering personally, at which point the kindly but embarrassed old man offers his virgin daughter as a consolation prize, whereupon the Levite instead sends out his concubine to be ravaged, after which he saddles her up, takes her home, and cuts her into 12 easy pieces. Coming soon to a Sunday school feltboard near you! That the USGA prefers its national championship lean toward the Old Testament's penal substitution system of blood sacrifice is more of a coincidence. The main reason I mention Judges 19 is that when telling stories, it is critical for the listener to understand context. Mind you, I have no idea what context could possibly explain such unmitigated evil as the above story recounts. But as one of the fortunate few to have been at Pinehurst in June 1999, I do remember not only the details of the unforgettable story that played out that week but what many of us were thinking at the time. Half the field this week can barely remember a time when Pinehurst wasn't part of the U.S. Open's unofficial rota. But as legendary as this Donald Ross masterpiece is and has been for decades, 1999 was the first time it hosted this championship. The way those four days unfolded ensured it would not be the last. Having an unspectacular player win unspectacularly doesn't automatically doom a host venue in its quest for future majors. But marquee names, tortuous twists and turns, a flourishing finish, and a singular snapshot for our minds' eyes to take home with us as a souvenir all but guarantee a rookie major site gets the call again. Pinehurst '99 had them all on Sunday alone. You want names? Start with champion Payne Stewart, one of golf's most iconic figures, fending off the best players of that era: Phil Mickelson, already one of, if not, the best player without a major; Vijay Singh, who'd won the PGA the previous August; the once and future king Tiger Woods; and then-No. 1 David Duval, who had ascended to the pinnacle of the rankings with four wins already that year, including The Players Championship. In fact, of the 11 who finished in the top 10 (two tied for 10th), nine were in the top 22 in the world rankings going in. The two that weren't: Tim Herron, who had won Bay Hill three months before; and Billy Mayfair, whose two wins in 1998 included a win over Tiger Woods at the L.A. Open that to this day remains the only playoff loss in Woods' career. Flourishing finish? For sure. Stewart saved par with an absurdly snaking 25-footer at 16. Both Mickelson and Stewart feathered in a pair of beauties to the par 3 17th; Mickelson missed, Stewart sank for a one-shot lead with one hole to play. Tiger's birdie at the impossibly difficult 16th pulled him even for the championship, only to drop one with a lip out for par at 17 and a purely struck but wide-left birdie attempt at 18. Stewart's pitch out from the rough at 18, Mickelson's near-make for birdie, and Stewart's uphill par putt for glory - all of which occurred in an eerie mist that looked lifted, cleaned, and placed directly from Donald Ross' native Scotland. Singular snapshot? One of the most instantly recognizable scenes in the sport's history, Stewart's one-legged lunge into immortality. A bronze likeness of that pose, a statue of Stewart's unlimitations, now stands sentinel on the Pinehurst property. In examining Sunday's final pairing, the tendency is to remember that incarnation of Mickelson as the err apparent to Avis, the nickname Stewart was derisively given because of how often he finished second. But whereas Stewart had a history of falling short, including the year before when he couldn't close out the Open at Olympic Club, Mickelson on that Sunday in '99 had no real scar tissue to speak of. This was before the close calls in Grand Slam events piled up. Pre-PGA in 2001, before Bethpage in 2002. The truth is, Mickelson's problem prior to his breakthrough at the 2004 Masters was less that he frequently blew chances in big events and more that he didn't really put himself in position to win very often. His most famous flops in major championships actually came after he'd become a major champion. Pinehurst was his first best chance to win one of the four biggies. And that is evident in the replay of that final round. Mickelson, while intently focused, is brimming with the confidence of a guy who believes he is about to win. When I watch that video, I don't see a guy with the weight of the world on his shoulders. Actually I do. But it's not Mickelson; it's Tiger Woods. The erstwhile No. 1 has been so long stuck on 14 majors that we forget he wasn't born on that number. In fact, at Pinehurst that year, he was tied for last among major winners with one. And in that final round, he wore on his face - especially in the closing moments - the look of a guy whose self-established expectations weren't a buoy but a burden. Tiger was more than two years removed from his epic but only major championship, the 12-shot Masters romp in 1997 that made us all wonder if he'd ever lose again. By the '99 U.S. Open, the pressure - from within and without - to win another major had escalated. And you can see it in his face. This was Tiger's first legit chance to win one of the big four since the '97 Masters. And the Slam slipped away. As crazy as it sounds, you could've made a reasonable case upon exiting Pinehurst that Sunday night that Mickelson's prospects of winning a major championship were almost as good as Woods'. We know now, of course, that Phil's and Tiger's paths would diverge into the Woods dominance that made the latter one of the greatest of all time. In August of '99, Woods won the PGA and backed it up with the last three majors of 2000 and the first of '01. By the time Mickelson became a major champion, following that 2004 Masters title with another in 2006 sandwiched around a 2005 PGA, Woods was winning them at an even greater clip: the 2005 Masters and British and 2006 British and PGA. Had you tried to envision a 2014 U.S. Open at Pinehurst in the aftermath of the first one in '99, vis-a-vis the four principal characters - Stewart, Mickelson, Woods, and Pinehurst - the only reality you would've believed is that the course would be hosting its third national championship. With the champion long and tragically gone, Tiger an endangered species, and Mickelson with three kids but still no U.S. Open trophies, it proves the truth - both ancient and contemporary - is stranger and, sometimes, more painful than fiction. 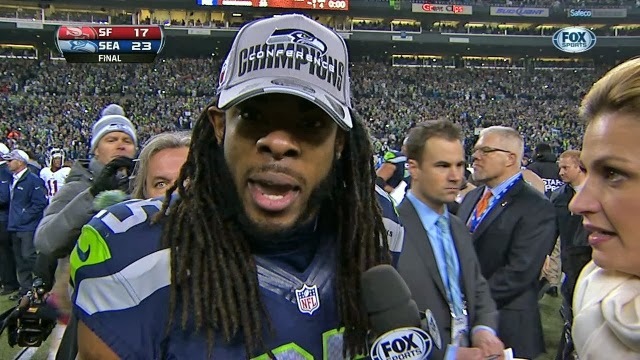 I didn't like Richard Sherman's verbal disemboweling of Niners wide receiver Michael Crabtree either. But as I sat here at home this morning on a day set aside to remember Dr. Martin Luther King, I began wondering if it was easier for me to dislike that diatribe and, thus, the Seahawks cornerback, himself, because he is a black man with dreadlocks who spoke angrily and aggressively into a microphone held by a pretty, blonde, white woman (Fox's Erin Andrews). Surely my distaste had only to do with what he said. (Here is what Sherman had to say about what he said.) Had a white player screamed the exact same thing in the exact same way to, let's say, Pam Oliver (Fox's veteran sideline reporter, who is African-American), I believe I would have been just as off-put. I believe. But if I, and other white people, knew that aforementioned imaginary white player was a straight-A high school student from a two-parent family who chose to play college football at Stanford because of its academic strength or that his foundation specifically helps inner city kids with resources to help them excel in school - all of which describe Richard Sherman - would we have more readily given him a pass, excusing his rant as pure postgame adrenaline? Or would we have even needed to know that backstory to chalk up the white guy's conduct to simple sports braggadocio? I hope not. At least not most of us. Surely the viciousness spewed at Sherman on Twitter (WARNING: graphic language), the kind of ferocious and feral hate speech that would have even been startling 50 years ago in the deepest recesses of the segregated South, came from a minuscule minority. Surely. But on this day especially, I want to at minimum have the courage to ask myself hard, uncomfortable questions about what is really going on in my heart and head when it comes to how I see people who are different from me in some way. It seems the very least I can do to honor and mimic the man who gave me this day off. Right now, much of the world is thinking about the young woman who left home and gave birth to a boy. Today, I'm thinking of another mother, on a different kind of journey, returning home to prepare for the passing of a child - also her firstborn, also a son. "My soul glorifies the Lord and my spirit rejoices in God my Savior, for he has been mindful of the humble state of his servant." "We are already so thankful for the many many extra days we've had with him since last November 12 when he was diagnosed and since the first relapse on July 23. Our Liam is the most wonderful little boy. We are so so so happy for the almost seven wonderful years we've had to be his mommy and daddy." Mary is said to have treasured up the events surrounding her son's birth and pondered them in her heart. Amy treasures her years as Liam's mother. And ponders. Two young women, separated by 2000 years, their journeys taking them in different directions. Yet our faith in Mary's son tells us Amy's won't be gone from us long. Liam died January 17, 2012. You can honor the Lowe family by donating to the water well project Liam started. Click here. I was in the building when the Texas Rangers began this cuticle-chomping journey to the doorstep of baseball glory. Tampa Bay 9 Texas 0. The same score of a forfeit, which is what it felt like my wife, son No. 2 and I had done with our time and money that day. C.J. Wilson gave up 8 of the 9 runs (6 earned) in that playoff-opening loss - the only game they would lose to Tampa Bay. He was awful. Worse, he lost to a 22-year-old kid making his second career start. His subsequent starts were varying degrees of better, the most recent of which was Monday night's Game 5 outing in which he got through 1 out in the 6th, allowing 2 runs (1 earned) on 4 hits, 5 walks and 3 strikeouts in a game for which he - like St. Louis starter Chris Carpenter - would receive no decision but which the Rangers would ultimately win, 4-2. At no time during the playoffs has Wilson looked like a legitimate ace, prompting a groundswell of Rangers fans to implore the team not to go all in when he becomes a free agent at season's end. Some of it has to do with his personality. He's a little cocky, which may - and I can't substantiate this so it's just a guess - be a first for an athlete in a high-profile position on an elite team. Some of it has to do with the involuntary facial tic we as Rangers fans still have whenever we hear "Chan" "Ho" and "Park" in the same sentence and the accompanying trepidation over emptying the vault for a starting pitcher. Most of it has to do with how he's pitched in this year's playoffs. Regardless of the reason, we need to get over it. - capped by a Game 5 no decision in which he 5.1 IP/4 H/2 R/1 ER/5 BB/3 K - CJ Wilson: Exasperating? Occasionally. Subpar postseason? Yes. True ace? Not yet. Lots of Rangers fans saying good riddance as he enters free agency. Seriously? In his 2nd year in the rotation and 1st as their #1 starter, CJ was top 15 in all of MLB in Ws, ERA, Ks, IP & starts. So you WOULDN'T want 5 more years of that? Is there so much starting pitching on this team that you're ready to kick to the curb one of your homegrown pitchers just as he's coming into his own as a starter. This is the piece I wrote for PGA.com upon the passing of Byron Nelson in September 2006. Part of it was read both at his funeral and the ceremony in Washington, D.C. when he was posthumously honored with the Congressional Gold Medal on June 26, 2007. That remains the highlight of my career in journalism.